Elder Gary E. Stevenson (b. 1955) was called as a Seventy in 2008, then as Presiding Bishop in 2012. 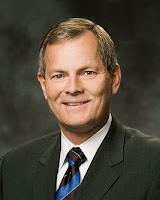 He was called as a member of the Quorum of Twelve Apostles in October 2015. "Without Christ, there would be no Christmas. Without Christ, there can be no fulness of joy. 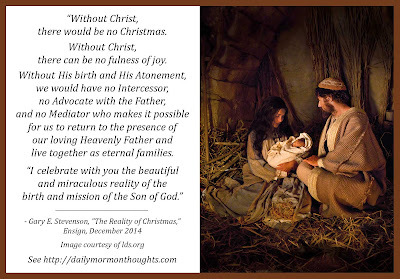 Without His birth and His Atonement, we would have no Intercessor, no Advocate with the Father, and no Mediator who makes it possible for us to return to the presence of our loving Heavenly Father and live together as eternal families. "I celebrate with you the beautiful and miraculous reality of the birth and mission of the Son of God, and I bear my testimony that Jesus Christ is our Savior and Redeemer—the promised Messiah." Elder Stevenson encouraged that we actually do something in the Christmas season to show outwardly the feelings of our inward hearts. The Light the World initiative offered by the Church this Christmas season has provided a number of ways to do that, through service, sharing, kindness, and worship. Labels: Atonement, Christmas, remembrance, Stevenson Gary E.